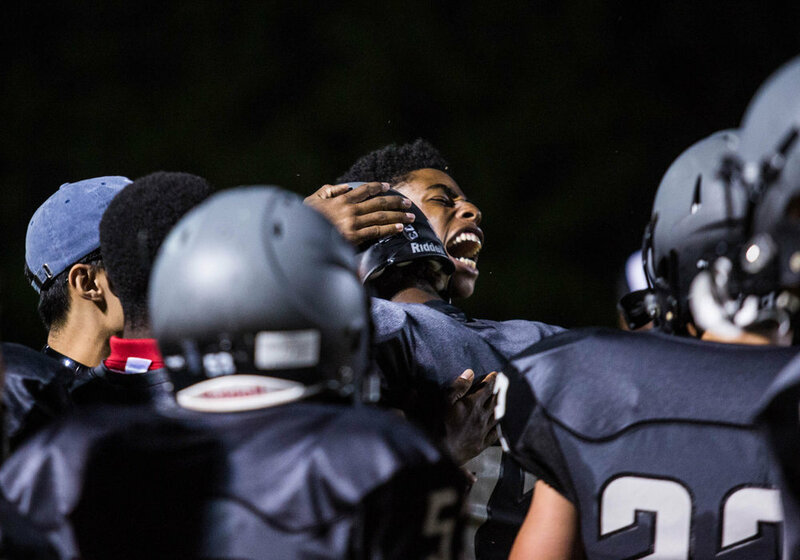 East Chapel Hill High School football program has weathered a rough couple of years. 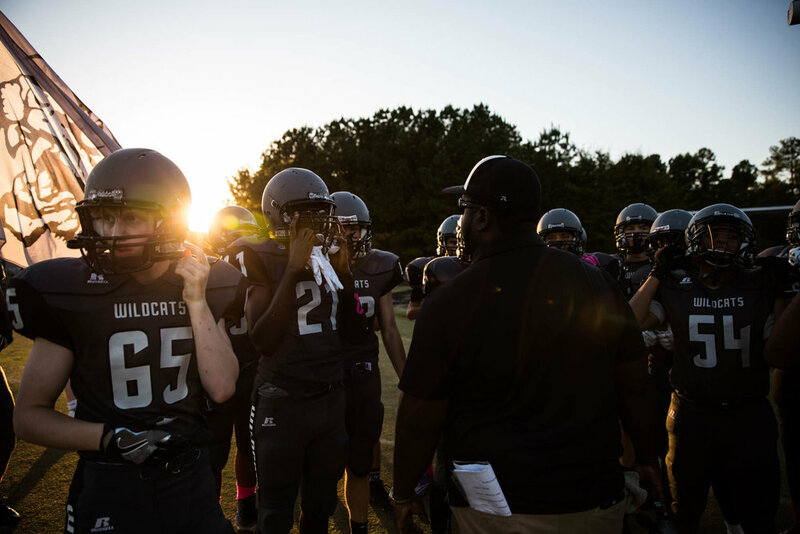 After losing all but one game in 2016, the school decided to only play in the JV conference for 2017, with the goal of building their program and abilities. While the season started slow, they gradually gained traction and eventually went 6-3-1, with plans to start a varsity schedule next year. The team tried to get closer on and off the field. They participated in multiple community outreach and team building exercises, as well as practicing hard every week. Watching tapes and spending serious time in the weight room has emboldened their spirits, leading to much excitement about next year’s season. They hope that their results from this past year attract new players to a small program, so that they can continue to grow and improve. Ted Rogers, the Offensive and Defensive Line Coach puts the team through practice on November 1st, 2017. Because there are so few players, Rogers often has to stand in and tackles with the team. “I feel this year was pretty good. We played hard and actually connected with each other. We worked hard in practice and stayed focused,” said Chandler Farrow, a sophomore offensive lineman. Kicker Max Butler, a junior who first joined the team this year, warms up for the Homecoming game against Northwood High School. “My favorite memory is probably working with special Olympics this year and really feeling what it’s like to come together as a community and help out others,” he said. Players ride the bus on the way to a game against Orange High School, a game where they lost 38-14. “This year has been a great year because we have all improved a lot. Its given a lot of people a time to shine and just improve in practice and also in the games. And I think playing a JV schedule will help us a lot with varsity next year,” said Will Donaldson, a junior quarterback. Players get ready outside of Orange High School’s football stadium. As a JV team, they don’t usually get into locker rooms, creating a bonding experience when they all put on their gear together outside. “We built a brotherhood this year and that’s really important. 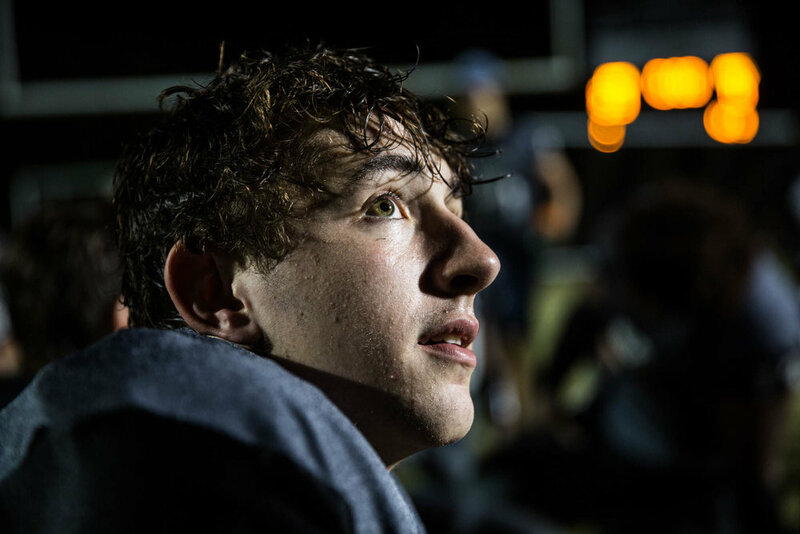 We played for each other,” said Jeffrey Monroe, a junior halfback. Cheerleaders cheer for the very few fans who showed up to watch their game against Orange High. As a JV team, very few peers from school show up to the games to support them. “I think coming into it I felt pretty good. I mean with the JV schedule we went 6-3-and 1 and I think that’s better than many previous years. 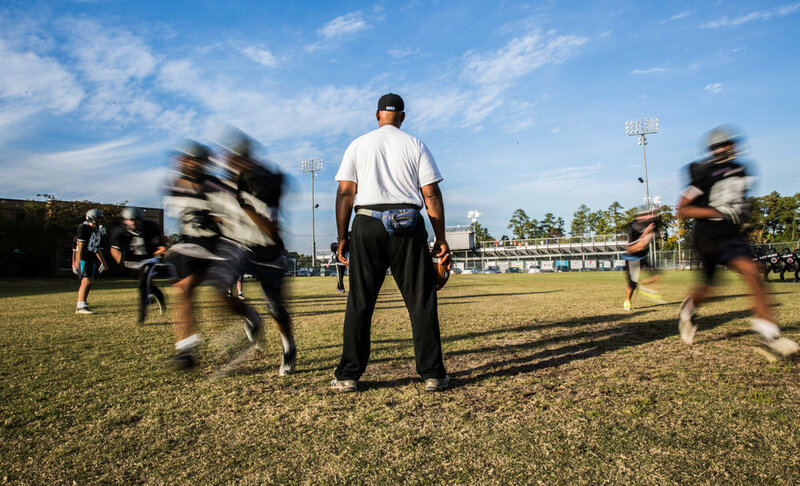 And I think overall we did better and we can see what we have for next year going into varsity, we see the people that we have and the talent that we have,” said Xavier Rogers, a freshman quarterback. 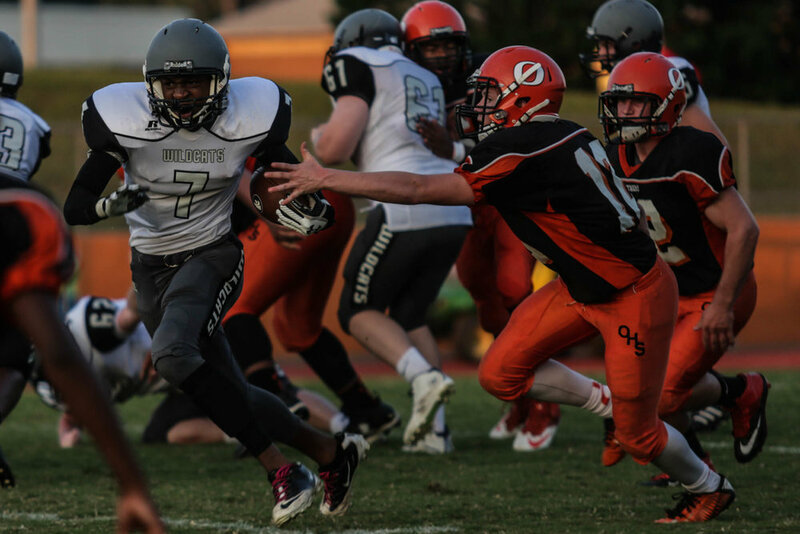 Zaion Vaughn, a sophomore wide receiver, breaks through Orange High School players. “Next year I’m really excited. We will have a lot of experience under our belt and it’ll be a fun challenge just to see what we can really do on a varsity level and we’ll have a lot of players ready to go,” said Donaldson. A player rides back on the bus after the loss to Orange High. “I feel confident for next year, to see all of our hard work go from JV to Varsity and see it transfer over. Hopefully more people will come out after they see our record and see how well we’re doing so I feel pretty confident for next year,” said Rogers. Donaldson throws the ball during a drill in practice. “My favorite memory was when we played Northern and we were down by 2 touchdowns in the 4th quarter and we got our final two scorers to come back and win with under 2 minutes left and that was a really exciting game and a game that really brought all of us together. It was just a huge victory for our team and our program and it’s a milestone,” he said. Players gather before the homecoming game kickoff for a last minute rally speech. “We came together as a team and family and got things done this year,” said Butler. Players grasp hands before a home game. “I’m pretty confident about next season because we actually had a strong team this year. If we keep staying together and hit the weight room we could actually get stronger, actually compete,” said Farrow. Grayson Clements, a junior halfback, runs the ball in a home game against Southern Durham. The Wildcats barely won, 21-20. “Against Southern, scoring the go ahead extra point was pretty cool, especially because kickers don’t usually get to do much,” said Butler. Players celebrate after a close win on homecoming. The Wildcats triumphed 33-0. “I think we got a lot of players who are really committed to being better in the off season. A lot of people are going to come out to the weight room; no days off. I’m really excited to play a varsity schedule next year and show east what this new team is all about,” said Butler. Monroe listens as coaches discuss their last win of the season, a nail-biter against Southern Durham. After the win, everyone rang the East Chapel Hill High victory bell, and everyone got excited for the upcoming year. “It was a good season,” said Monroe, smiling.